Back in February, I wrote about The Mess at the Top of the Stairs, my boring-beige-blah bookshelf moment that was the first thing anyone saw when coming upstairs. Needless to say, I like this a whole lot better. I don't remember the paint color, but it's by Behr and has a name like "Jamaica Bay" or something Caribbean. 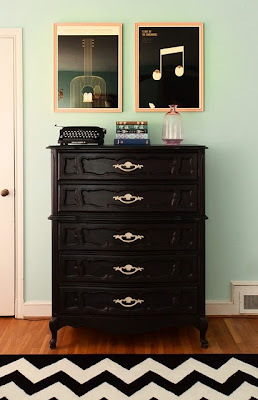 My inspiration was the photo below, but when it came down to it, I just didn't have the heart to paint up my old bureau. It seemed a little more dignified to leave the wood as-is. The mirror is old, but it's not an original Turner, or at least I don't think so. I was happy to go from all-new, almost all-Ikea in the old version of this space, to almost entirely vintage in the new version. The only thing I bought for this project was the paint; everything else is stuff I already owned and styled here. The mirror is just propped against the wall, and along with the fan, it brings an Old Florida kind of vibe, which I like now, but will probably swap out as the seasons change. Challenging to try to take shots of all this, without having my own reflection show up. A better, more realistic-for-the-times morality tale, is A Summer Place. Oh, now that's a good summer movie. And it has some great interior set designs, to boot. 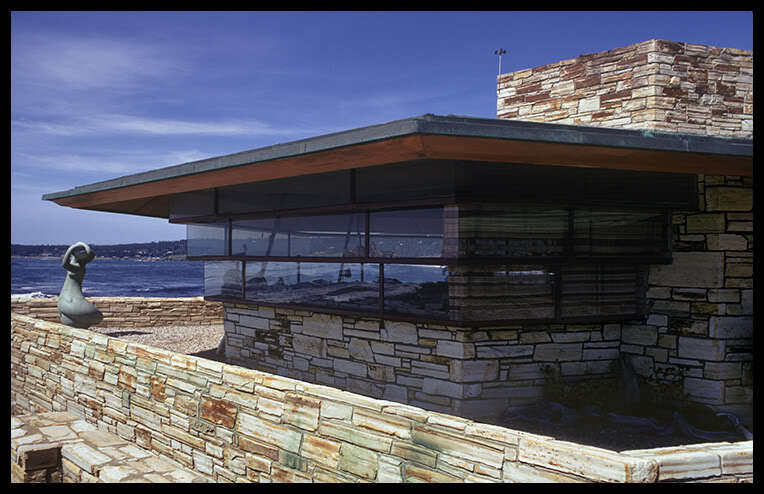 AND, it features a house on the Carmel coast, built by Frank Lloyd Wright. 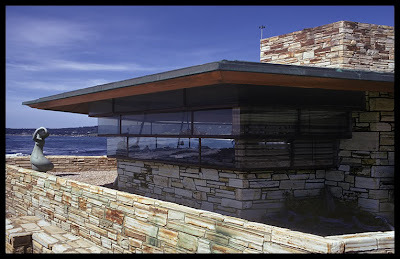 See how I brought the conversation back to design there? Yes, I really am that slick. *I should note that the original post and "mess" actually refers to my desk, located over to the right of the bureau. This area has also been painted and much improved upon, but it wasn't quite ready for its close-up on the day I took these shots.